Keith Menear has spent his professional career as a Chemist in the pharmaceutical sector, however twenty years ago he was introduced to pottery by his wife, since then his hobby has become a full time preoccupation. Keith Menear’s interests lie particularly with glaze chemistry on stoneware and raku clay bodies. The stoneware work is produced on a smooth white body and is crafted by hand throwing on a foot operated momentum wheel. The forms are intended as contemporary bowls and vases. The glazes are all developed in the studio and fired at the more energy efficient temperature of Cone 6. The Raku ware typically has unglazed areas to expose black smoked regions which contrast with the glaze. The immediacy of the process also allows manipulation of the glaze chemistry through the addition and spraying of metallic salts. 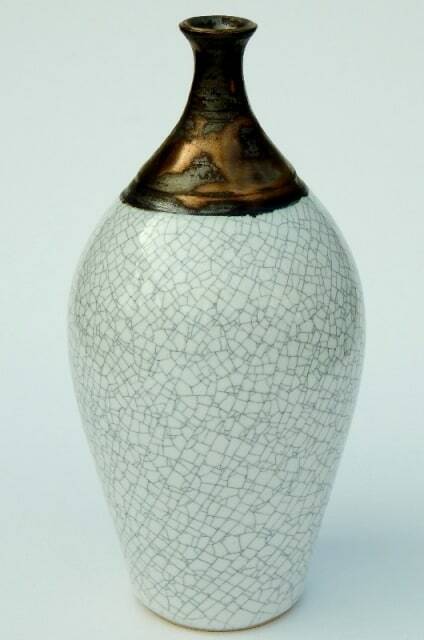 Keith Menear is an associate member of the Craft Potters Association, a Fellow of the Royal Society of Chemistry and a member of the Southern Ceramic Group.